For iCloud users with automatic backups configured, the iPhone, iPad, or iPod touch will backup to iCloud every evening when connected to wi-fi. This usually goes without a hitch, but sometimes you may check the iCloud Backup settings to discover a vague message stating “The last backup could not be completed.” You may also see this backup failed error when trying to complete a manual iCloud backup from an iOS device too. Given how important regular backups are, this error message can be annoying and distressing, but fortunately it’s usually quickly resolved with a few simple troubleshooting tricks. Before trying anything else, the easiest and most reliable troubleshooting method is simply forcibly rebooting the iOS device and trying to backup to iCloud again when it boots back again. A reboot is usually all that is needed to resolve this error and get iCloud backups working again. You’ll want to be sure you’re on wi-fi and that the wi-fi network connection is decent, a poor connection can often be the cause of the error message. Nonetheless, if you’re still having trouble, there’s a few more tricks to troubleshoot. Tedious perhaps, but backups to iCloud from the iOS device should work again. Finally, if none of the above is working, you may want to try backing up the device to iTunes on a computer, turning off iCloud, then restoring the device from your newly made iTunes backup, this wasn’t necessary for my particular case but in extremely stubborn “unable to complete backup” scenarios it should resolve the problem once and for all according toiDownloadblog. Yes, restoring can be a nuisance, but not being able to backup an iPhone, iPad, or iPod touch manually to iCloud or through automatic backups is even worse, particularly given the convenience of the auto-backups. For what it’s worth, a similar error can happen on the desktop with Mac and Windows,where an iTunes ‘could not backup’ error message appears sometimes, usually due to a damaged USB cable or corrupt local backup file. Why does the “The last backup could not be completed error” appear at all? 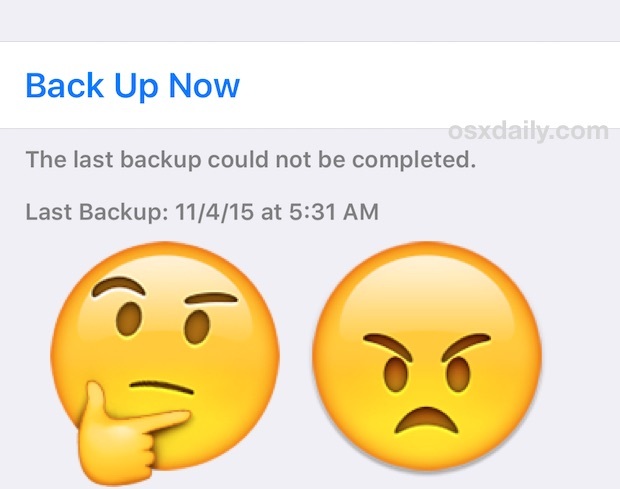 It’s difficult to know, but backups can fail for many reasons, sometimes it’s just a matter of a bad network connection, insufficient bandwidth, a network timeout, or, as is resolved in the latter troubleshooting steps here, it may be an issue with the existing iCloud backup too. If you’ve encountered this error message and fixed it on your iPhone, iPad, or iPod touch with one of the tricks above, or with another method, do let us know in the comments. I see this message often on a particular wifi router. I have to manually start a backup with this router otherwise it has an error. I think bandwidth is kften the cause. My iCloud Automatic Backup doesn’t ever complete due to my use of a VPN. So if I want a cloud backup I turn off the VPN and do the Backup Now and it works. None of these steps, including turning off iCloud, and restoring from iTunes worked for me. I do not use VPN. The iTunes was vexing, too, because the syncing process restored apps I didn’t want. I have encountered “the last backup could not be completed” message for about a month now on an iPhone 6. I’d seen the “fixes” on this OSXDaily posted elsewhere, but waited until today to give it a whirl. So I’m bummed that none of this worked, and now I’m going to have to scramble to recover those lost WiFi passwords. Interestingly, running the same iOS (9.1) on an iPad, I’ve got no problem backing up to iCloud. Rebooting and insuring that a stable wi-fi connection is available has worked to resolve the issue every time for me, and I encounter it somewhat regularly. It’s the nature of troubleshooting that not one thing works for everyone, but it’s such a simple task to reboot that there is no loss other than a few minutes. Backup and restore with iTunes seems to be the last option. I have the same issue on my iPhone 6. I haven’t been able to complete an iCloud back up since updating to iOS9 and updating to 9.1 and now 9.2 hasn’t fixed the problem either. I’ve deleted the iCloud back up, rebooted the phone, none has fixed this….and as with you, I have an iPad that initially had the same issue but then just started working. Frustrated, this is a major bug. p.s. just chatted with Apple and they said most of what’s posted on the web to fix this problem doesn’t work. This issue can be different for each device. Most fixes on the internet don’t work. We are aware of this issue and our engineers are working to get it fixed as soon as possible. Until then you can either backup to iTunes or follow these steps: Restore from iTunes Backup using the steps below. 1 Back up the device to iTunes. 2 Perform a recovery mode restore(Opens in new window)(Opens in new window). 3 During the setup assistant, choose to restore from the iTunes backup. 4 After the restore has completed, go to Settings > iCloud > Storage > Manage Storage > [Device Name] and delete any existing backups for the problematic device. Note that when the customer first goes to the Settings > iCloud > Storage > Manage Storage screen, then taps the device name (this device), they must wait for the screen to load completely (and wait for the spinning pinwheel in “Backup Options” section to go away) before deleting the backup). 5 Go to Settings > iCloud > Backup and turn iCloud Backup off. 6 Wait about 2 minutes and turn iCloud Backup back on. 7 Try to backup to iCloud again. The directions you got from Apple are a combination of the steps in this exact article, basically, backup to iTunes, delete the iCloud backups, and restore. Not sure why you are complaining or confused other than being annoyed with Apple service quality. I am frustrated to encounter these errors too, Apple needs to fix iOS, OS X, iCloud, etc. Often, reboots fix just about everything, funny how that works now with iOS just as it did with Windows 98. Ultimately Apple wants to sell us a new iPhone, a new iPad, a new Mac, they do not want to put much time into troubleshooting software issues as there is no money in it. I think that drives much of this from the top down. Your glass is half empty. Glass half empty? You are not thinking for yourself, if you think that Apple doesn’t only think about the bottom line and how to get people to buy the newest hardware. They do their best to make their older equipment fail, so YOU will spend more money. I followed the above directions. Now I’m unable to turn iCloud back on, I get the error msg “iCloud backup failed”. It just keeps me in this endless loop.. Frustrated ! Any other options ? and let one of they’re techs deal with the problem for you. You don’t want to “brick” your phone without a solid, current backup. Ok, so I am having the same problem. I did a hard boot and still nothing. It wouldn’t even let me delete my old iCloud backups. So I turned off iCloud backups, restarted my iPhone 6s +, turned it back on, and tried it again. Happy to say that at least now it is trying to do the backup. So far so good. This didn’t help. I’ve had several conversations with tech support and they couldn’t resolve the issue either. I was told someone would contact me when they had the solution, that was two weeks ago. “Couldn’t be completed, not enough space….” when there was PLENTY of space all long. A restart fixed the problem. In some cases, these steps won’t provide the solution. (I know because I was taken through them all during a 3-4 day period of working with Apple on this problem.) In my case, the only thing which solved the problem was working with Apple and (finally) having them escalate my case to the engineers who are behind the iCloud service. The apparently did something on the cloud and thereafter it worked prior. Prior to that, NOTHING rectified the situation. The unfortunate part about this hassle is that, in order to get Apple help to take me seriously, I had to first spend numerous hours tediously going through all these preliminaries–on and off the phone–during a number of “sessions” with Apple support over a period of several days. IMHO, many of these vendors aren’t testing their stuff very well and expect their users to be the guinea pigs. Who has time for this sort of messing around? This nails it, and with Apple having a “pubic beta” program (which they completely ignore every bug report users file with) they count that as good enough and ship whatever broken OS is at a specific deadline. They have timelines to meet, get the iOS or OS X update out by this date that’s all that matters. Quality, stability, and performance are somewhere missing from the checklists, there seemingly no quality assurance. Troubleshooting software issues can take hours if not longer, you’re exactly right, who has time for this? This is why I can not recommend updating any Apple software anymore, every update breaks things, or slows things down so much to the point of the device being nearly useless, there is never a feature that is necessary or essential to make any of the hassle worth it. When you get your iPhone or iPad, stick to the version of iOS that’s on it from the factory. Do. Not. Update. You won’t gain a thing, and you’re more likely to lose hours to fiddling around at best. But what they’re really hoping is that you’ll wander into the Apple Store with your freshly broken or slow iDevice, pick up a shiny The New iDevice, and buy that instead. It should be noted that, for me at least, automatic iCloud backups require a Wi-Fi connection and being connected to power. The former alone won’t do it. I’ve also found that at times, iCloud backups fail for no apparent reason; I don’t consider them reliable and make sure to manually force one every so often. It’s also important to make sure such backups are successful. I neglected to check before updating to iOS 9.1, and discovered after the fact that it had failed. If I hadn’t had a local iTunes backup, it would have been a bag of hurt. I always do both types. I try the Apple support line and they said that engineers are aware of the problem and they are planning to address it with the next update. I hope so. I’m not interrested in restart the iPhone 6 Plus from the factory settings. Same issue as everyone here. In all my years with various devices from Apple and iOS versions I’ve never had this problem. Apple please address. iPad3 ios 8.3 having same problem with iCloud backup not able to complete since Oct2015. Thank you osxdaily for temporary fix until Apple gets their act together with a fix for this wide spread problem. I did exactly how this article suggest in the first place and it worked! My iPhone 5 will not backup automatically! My iPad does backup every night! Not exactly sure when this problem started, but something I was told to do on a site now shows that I’ve never backed up my iPhone 5 to iCloud. I’m looking to get a new iPhone 6S plus, but I want to get this issue resolved before I do so I will not lose any of my info. I am having the same problem. I had my new iPhone 6s December 17th and have not been able to back up to iCloud. I have deleted my iPad back up in iCloud but am worried about deleting my other iPhone back up. This was from my old iPhone 5s. I don’t want to delete that back up and wipe any data I currently have on my 6s. I have backed up to laptop, but would prefer to back up to iCloud. Back up starts and tells me it will take 6 hours and gets half way and does not complete. Can anyone help ?? Same problems. I deleted my only backup but had to delete using an ipod touch because on my iphone it said latest backup “never” so I had no access to even delete. It worked ONCE and has not worked since. Device simply does not back up automatically, even though I see the numbers change slightly like maybe it’s trying to backup but wont. I have had this happen several times now over the years I’ve been using iPads. And once again now. Long, tedious wipe and restores each time. The first symptom seems to be an app that stalls when updating and which is then hard or impossible to delete. I’m feeling rather torn at the moment; in one hand I’m sorry to see so many others are having this issue. Yet on the other hand I’m relieved to see so many others are having this issue because: there’s strength in numbers, I’m not alone, misery loves company … take your pick. And don’t feel bad about your issue until you can match this: I’ve been experiencing this issue and working with Apple on this since May 19th of 2015! I’ve gone through (meaning they threw in the towel and couldn’t provide further help) 5 (yes five) Senior Advisors! The iCloud Technicians have delved into my account once already and are due to go back in (hopefully) this week. The first time they discovered my iCloud Photo Stream was ‘clogged with photos and video dating back years’. As I’ve been using iPhones since the first day the original iPhone was released in the US, they said the data amassed was unequalled. They removed this massive tumor of data and things appeared fine for approximately 30 days when suddenly my device showed the symptoms described here. I’ve tried it all on my end, so the technicians are my last hope. If you’ve tried it all and are still having issues – the sooner you contact support the better. Because according to my latest Advisor, ‘the techs are so backed-up with cases like yours, right now expedited tech support (normally meaning they’re on your case and in your account within 24 hours) has a minimum wait of 30 days. Good Luck Everyone! Well been on this issue for 4 days. Called Apple got the same as listed in above post. My advice don’t listen to any support agents until u get escalated. DONT RESET WIFI CONNECTIONS that’s a joke, you might as well go wash your hair. As atleast you will have clean hair to spend hours reloading your wifi connections as you travel thru your past places again. It’s a real sad deal they charge so much for hardware they know little about supporting the software side of it. Androids never crank started my desire for wanting a smartphone but now nor does The CRAB-APPLE. So dam frustrated. Apple says they don’t take advice here. You know they do. While you explain the issue they are Googling help. Google yourself will likely be as beneficial. GOODLUCK and may the behind the front lines tech support help you that’s the stage I am in. One of the earlier posts gave me an idea to try. Go to settings, icloud, click backup, turn off. Waited 30 or so seconds, turned backup on. Entered icloud password (required). Then attempted “back up now” and it worked. Problem solved – at least for my situation. Easy 2 minute fix. I have an iPad 2 that has never been backed up and I don’t have any other computer to backup with iTunes. I have tried most of ideas listed and it just won’t work. Very frustrating. Supposedly I have 4.6 GB available and my iPad only needs 364.1 MB and Mail Ned’s 5.6 MB so I am flummoxed. My fix was to re-enter the password associated with my iCloud (Apple ID). For some reason it had an incorrect or perhaps outdated password sitting there and when I entered the correct one, backup begun to proceed. Correction. I had thought it was proceeding, but it did not. As of now, I have still not been able to do the backup. The methods mentioned have not worked and I am unable to backup to Itunes due to low memory available. I’m trying to restore my ipod 5 using the iclloud storage…and when i do it says my ipod doesnt have the required update of 9.2!!! How would i update and restore ???????????????????????????????????????????????????????????????????? Has anyone come up with a solution to the iCloud not being able to backup? I’ve been having the same problem for 25 weeks and I have tried all of the so called fixes ! I overcome this issue by deleting the existing iCloud backup from iPhone. I’ve had the same problem for ages n have been experimenting. The only way I was able to to successfully back up was to exclude some of the currently installed apps from the back up. I excluded some apps but kept more important ones in the back up, successfully backed up, erased everything on my iphone, set up iphone using the above back up, reinstalled excluded apps (some installed by themselves even though they weren’t included in the back up) …… and guess what? now it backs up just fine with all the apps selected!! Hope this guide will help somebody. p.s. I have several iphones and only one had this issue, all the others back up just fine! I have also been having this issue on my new IPhone 6s Plus for several weeks and my IPad 4 for 7 months. I got the same error message “Your backup could not be completed” over and over again. We just now tried again on my IPhone, turned ICloud Backup off and then on again, and it worked. I’ll try with the IPad later.. We shall see. Very disappointed in Apple, there is NO EXCUSE for this. Thanks for all the info! This backup system needs an overhaul. Not everyone has a fast upload on their connections. This would make the first backup never finish properly without leaving the device hooked up and connected to wifi for a week straight in our case. Apple should make a backup option that’s like a hybrid between iTunes backup and iCloud backup – sync all the devices through iTunes then when the PC has idle time to sync the backup sets to iCloud in the background. Sounds like a perfect solution doesn’t it? Fought with the damn backup on my wifes phone for hours, finally realized she was still on the free 5gb icloud on her apple account. I upgraded to the 99 cents a month 50gb plan and the phone backed up perfectly. Wish I’d gotten an insufficient storage message, it would have saved a lot of time. Deleted old iCloud backup. Working now. I fixed my error by freeing up about 400Mb of available iCloud storage. I was getting close to my 5Gb limit, and I assume I didn’t have room for the backup. I deleted the old iCloud backup. It is now working. The previous backup created from my old phone used 2.5 GB of space. Since I only have 5 GB of iCloud storage, there was not enough storage space for the new backup. I have had this issue since May and reading the posts to delete the iCould backup was most helpful. It would have been great if the error message was clearer. trade it im and get an Android!!!! Thank you sooo much! I fixed it with the second method and I am really grateful for your help. Keep up the good work! Old problem is still a problem. I followed this tip, it, worked, thanks. Yes the inability to complete an iCloud backup occurs on a somewhat regular basis and the instructions here will usually fix the problem whenever it occurs. 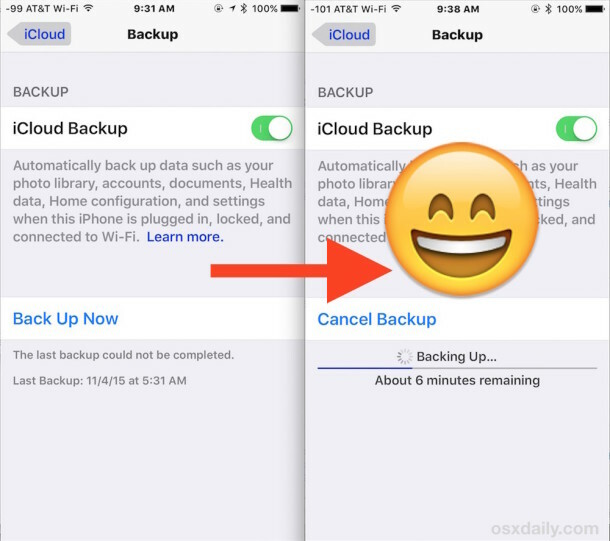 I’m glad to hear our fix tip worked for you and iCloud backups are working again! I went to iCloud, Storage, Manage Storage, Backups (lots of space used here) and unchecked Photo Library and other data hungry apps (Zonga Music was another). When unchecking the Photo Library I was warned that my photos will be deleted so I downloaded all my photos from iCloud (going to iCloud.com->Photos>Moments and then clicking Share for each Moment and cancelling the sharing screen to leave all photos selected, then Download). After that, the backup finally worked. Worked like a charm for me. Thanks!!! We had the same problem with an iPhone 6 with the lates iOS version 10.3.1. We tried every solution mentioned here, but nothing worked. Fortunately we had a spare iPhone SE, so we activated this SE with the same apple id as a new device and instantly made an iCould backup successfully. Then we retried the backup on the original 6 – and it woked like a charm! I’ve been unable to backup my iPad for two years now , forcible rebooting worked. i had the same issue. tried everything and the second method worked well for me. i rebooted my device then deleted old backup and started to backup again. hopefully it worked for me. This was very helpful – thank you! I keet getting notifications saying my iPhone hasn’t been backed up in weeks (it’s now 8 weeks since my last successful iCloud backup). When I try to manually back up by tapping “Back Up Now” in the iPhones settings menu, it says “Backing Up… Estimating time remaining…” but then it eventually fails and there is a message stating “The last backup could not be completed”. I remember getting the error message “the last backup could not be completed” a few years ago and managed to get it sorted but I can’t remember how. I’ve tried doing a hard restart of my iPhone but that didn’t work. so I guess I will have to backup to my PC and then delete the iCloud backup and hope that works. I really don’t want to have to restore my iPhone as it’s still on an old version of iOS to preserve the jailbrake. Are any of the other people experiencing the problem of the iPhone failing to back up using Jailbroken devices? I’m wondering if the jailbrake has any relevance? My iPhone 7 hasn’t backed up to iCloud ever since updating to iOS 12.1.4. I’ve signed out of iCloud and signed back in. I’ve even restarted the device and it still won’t back up! I am so frustrated with Apple.